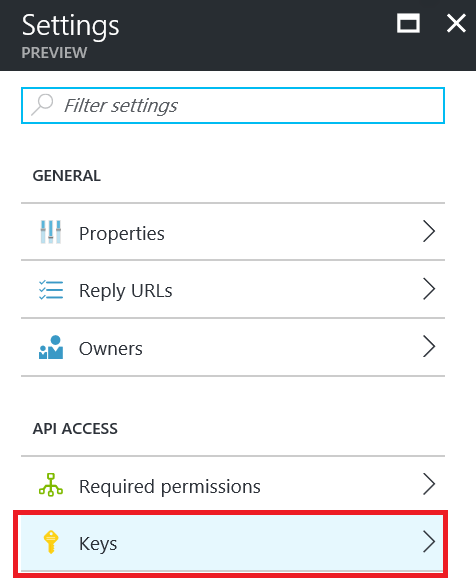 In my last article, I showed how to authenticate on Azure AD using a user name / password without using the native web flow. The underlying scenario was to migrate an application using an LDAP server by leveraging an Azure AD tenant. The logical continuation of that scenario is to use the Microsoft Graph API to interact with the tenant the same way we would use LDAP queries to interact with the LDAP server. Microsoft Graph API is a generalization of the Azure AD Graph API and should be used instead. It consists of simple REST queries which are all documented. 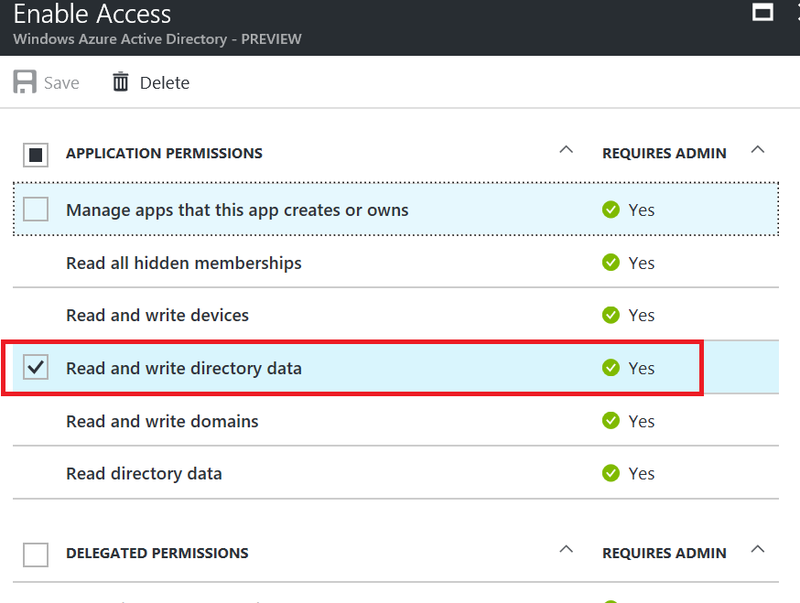 But first we need to setup the Azure AD tenant. We’re going to rely on the last article to do the heavy lifting. We are going to create a new application (here we’re going to use the name “QueryingApp”) of type Web App / API (although native should probably work). The important part is to grab its Application-ID & also to give it enough permission to create users. In this scenario, the application is going to authenticate itself (as opposed to a user) so we need to define a secret. We’ll need to add a key, save & copy the key value. This sample is in C# / .NET but since the Active Directory Authentication Library (ADAL) is available on multiple platform (e.g. Java), this should be easy to port. We need to install the NuGet package Microsoft.IdentityModel.Clients.ActiveDirectory in our project. Here the clientID is the application ID of the application we created at secret is the secret key we created for it. Here we return the access token as we’re going to use them. Here I use the popular Newtonsoft Json Nuget Package to handle JSON. By no mean is the code here a master piece of robustness and style. It is meant to be straightforward and easy to understand. By all means, improve it %500 before calling it production ready! Here we’re going to use Get a User of Microsoft Graph API. There is actually a NuGet package for Microsoft Graph API and, in general SDKs (at the time of this writing) for 9 platforms. Again, the code is minimalist here. The HTTP GET actually returns user information that could be used. Here we’re going to use the memberof method of Microsoft Graph API. Here, we deserialize the returned payload to extract the group display names. The information returned is richer and could be used. Finally we’re going to use the Create User method of Microsoft Graph API. This is slightly more complicated as it is an HTTP POST with a JSON payload in input. We can see that using the Microsoft Graph API, most if not all LDAP query can easily be converted. Microsoft Graph API is aligned with OData v3 which makes it a great REST API where filtering queries are standardized. Thanks for posting this, it really saved my bacon!. I ran into too many issues when trying to remove users from groups using the .Net API. It just wouldn’t work. This works like a champ for that. Hi ,your post is very interesting, I already did all the steps, I actually get a token but I do not understand when I use the microsoft graph api to upload a file is not working, in the AuthContext I only see that it gets the token, but not the user information or one account when save the file. also create a console application and a web aplication and two Azure Aplications With respect to the previous article but i think this applications dont work together. What API do you use to upload a file? Is it possible that you are running that code within an old version of ASP.NET? I remember a colleague having issues with async code awaiting for an HTTP call and the issue was a bug in old versions of ASP.NET. Something in the win32 threading mechanism that left the code hanging. You want to list all the users in the tenant? Thanks for the tip! I fixed 3 broken links (including the one you mentioned). Let me know if you find any others.